Here are some of the things we have found lately! One of my menu planning strategies is to not plan my vegetable sides. Why? This allows me to look for deals on what looks best or has the best price at the market. I am able to make a list generated by the main component of the meal for the grocery store, and then make sure I pick up 4-5 varieties of vegetables to accompany my meals for the week! Some of my farmers market favorites are zucchini, sweet corn, and lettuce, as these are low-fuss to prepare during the week and are usually abundant. 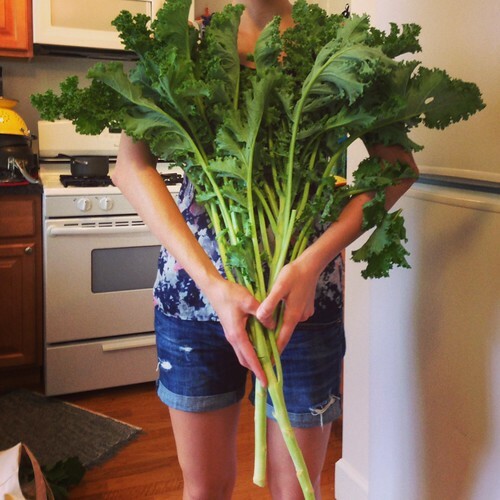 The most notable find, however, was this gigantic bunch of kale grown by the local middle school gardening club that I picked up for just $2! 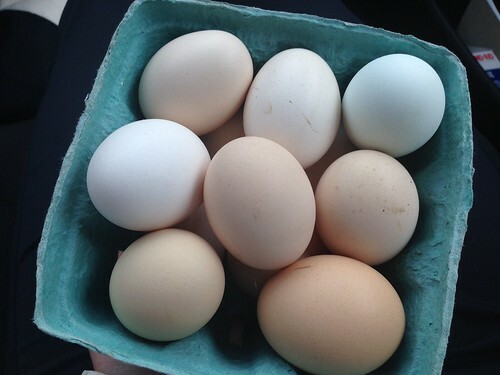 Farm fresh eggs are worth every extra penny, in our opinion. Not only do the chickens that lay them live a happier and healthier life, but the resultant quality of the eggs is incomparable to anything you could get in the grocery store. Not a believer at first, my husband directly compared a cage free, organic egg from Trader Joe’s to one from our favorite vendor at the Delmar Farmer’s Market. While the egg at Trader Joe’s was sunshine yellow, there was no comparison to the golden yolk that came from the farm fresh egg. 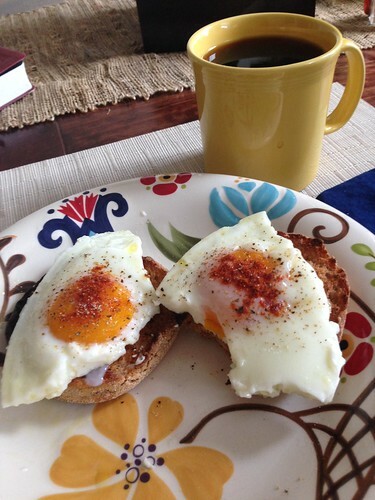 The egg whites are also less runny, which means that our fried eggs are much easier to cook perfectly. He is now such a convert that we are now on first name basis with the egg vendor, and may even head to their farm one weekend to meet the chickens and pick our own dozen! Not convinced? Here is a picture of our typical Sunday morning breakfast. Drool. For weeks, I had been eyeing the gorgeous zinnias and dahlias, lusting after the gorgeous colors. 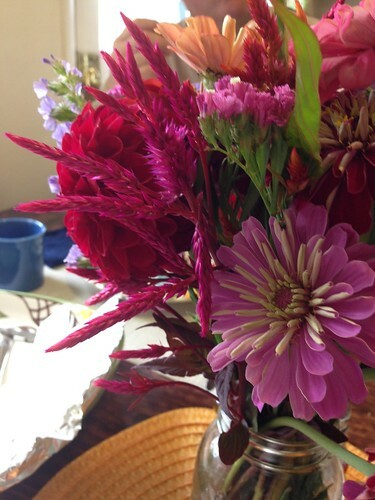 While flowers are never cheap, some farmers market bunches can run upwards of $10 for a small bouquet. Since they are not a necessity in our weekly budget, I held out for the perfect occasion to splurge on these beauties. Finally getting the new table that my sister and brother-in-law hand-crafted for me seemed like the perfect occasion! One of my favorite meals from the summer is actually one of our simplest. We put together a salad from the bounty we had picked up at the market the day before, and boy was it good! 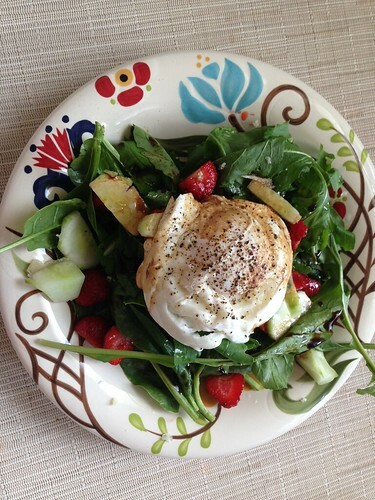 The base was a baby lettuce blend with arugula, topped off with cucumbers, local aged goat-milk cheese, and a poached egg. I also threw in a handful of sweet strawberries that we picked ourselves at a local farm, and finished the salad with a simple balsamic vinegar reduction. I wish salads always tasted this good! Question: Are you a farmers market fan? Share some tips and favorite finds below! Summer happened overnight in Boston, it seems. It has been warmer here than it has been in Southwest FL for the past few days! Now that is hot. When my thermostat reads 88F INSIDE the house, there is absolutely no way you can convince me to turn the stove on for longer than absolutely necessary, let alone even think about using the oven. I have survived 4 Boston summers with no A/C, but if it stays this hot for much longer I might break! A lovely, multi-colored, Mexican-inspired salad that is sure to brighten up any meal. I mixed mine all together right away and have enjoyed it for lunch for the past few days. You can eat it plain, serve it as a side for taco night, or even fill a tortilla with it! For those of you afraid of the long ingredient list, most of the work is just simple veggie chopping! Jicama is the most unfamiliar ingredient, but is a wonderful, naturally sweet, tropical starch-y vegetable that adds great crunch and flavor. I can see this recipe easily becoming a summertime lunch staple! I think it would be fun to turn it into a layered jar salad the next time I make it! Who said fruit salads are just for dessert? This Mango Blueberry Quinoa Salad also makes for another great lunch salad! The lemon-basil dressing is refreshing, and the blueberries and mangoes are unexpected but delicious. This is a must-make for any fruit lover! The last summer salad I made to go along with these delicious Chipotle Shrimp Burritos with Avocado Crema. I would highly recommend these burritos – simple, spicy, and flavorful. I cheated on the avocado crema and simply mixed a store-bought packet of guacamole with a spoonful of Greek yogurt, some extra cilantro and lime. To balance out the spicy shrimp, I kept the salad on the lighter side. This literally came together with the odds and ends left in my fridge, freezer and pantry from the week! The palmitos are acidic, soft, and refreshing. 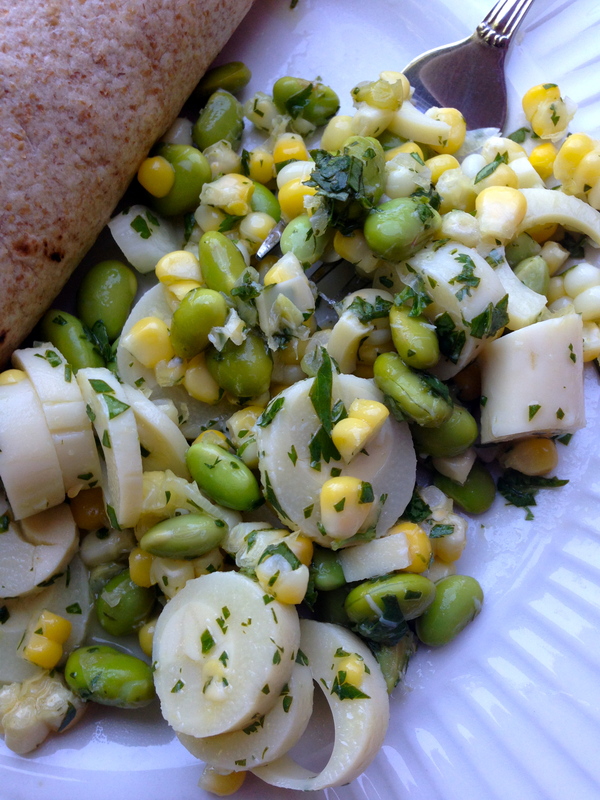 The edamame provides protein and substance, and the corn has a great natural sweetness. The dressing is heavy on lime, giving it a nice, fresh summer flavor. It reminds me of a grown-up version of succotash with a little South American flavor. It could easily be made into a main meal by adding some avocado and increasing the portion size! Cook the edamame according to package instructions. Allow to cool. Steam the corn for 3-4 minutes. Once cool, cut the kernels from the cob. Mix the corn, edamame, and sliced palmitos together in a bowl. Add the sliced scallions and minced cilantro. Whisk together dressing of lime juice, olive oil, and rice wine vinegar. Season to taste with salt and garlic powder, then stir to combine. Refrigerate for 1 hour before serving. You guys remember my awesome roommate, right? She has made her appearance a few times on this blog, mostly during our crazy roommate dinner adventures… You may recall the voluminous winter melon soup mishap or this tasty sugar-free apple crisp we created together. She is getting married in less than a month (yay!) and I was excited to think of creative ways to make her feel loved for her bridal shower a week ago. First, the non-food details! I had the week leading up to the shower off from school and studying, and so unleashed a bit of my crafty side in making these party favors. The small potted plants were her original idea for wedding favors, but the dirt and the size made them a bit impractical at her venue. Since we held her bridal shower in a park, I decided to make her idea a reality! The 4-inch pots are cheap, about $1 each at the hardware store. The flowers were also bundled in bulk, and so came at a steep discount. The signs also came together easily with some cardstock, popsicle sticks, and gel pens. 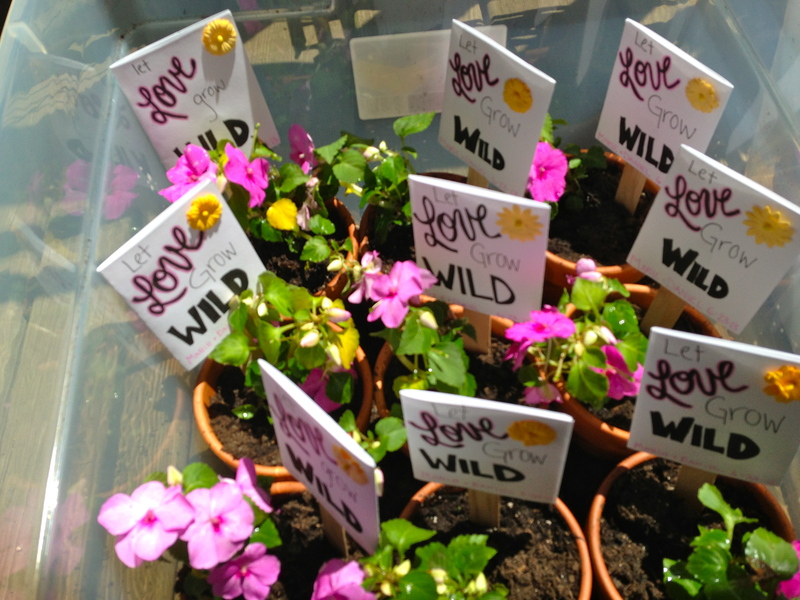 My grandma and sister were a great help and sat for an hour on the patio with me, making each of the 25 “Let Love Grow Wild” signs in assembly line fashion. I think they came out well, and everyone loved them! Another paper craft, this time made by a good friend’s mom. On the shower invitations, we asked everyone to bring a recipe for my roommate and her fiance to try out in their new kitchen! 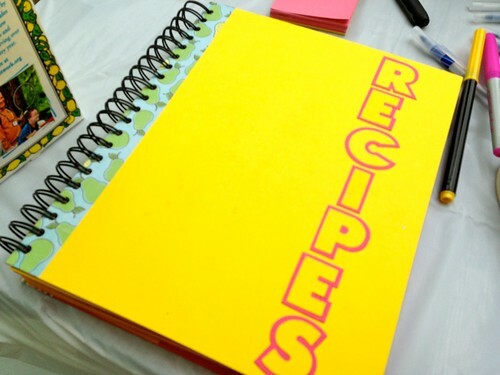 We gave her this book to help organize the recipes she has collected, as well as her new ones to try! This book is brilliant: there are blank cardstock pages to paste in printed recipes or ones cut out from magazines, and there are envelopes to store cards from friends and relatives. I have one of my own and I love it! I use it often to write down what I am making for the blog, which helps me to stay organized. If you are interested in getting one for yourself, contact Debbie at Life Is A Special Occasion (liasofavors@gmail.com)! Use your creative license with this salad – add some chickpeas, stir in some celery. 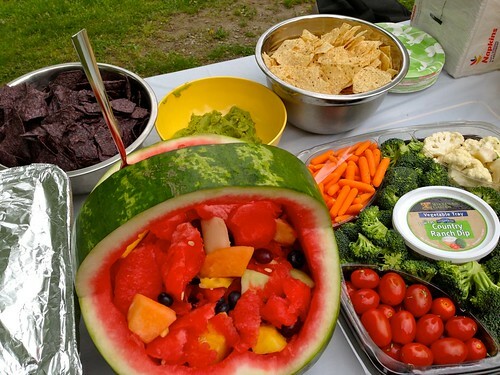 Make it yours and bring it to your next summer party! Cook the pasta according to package instructions. 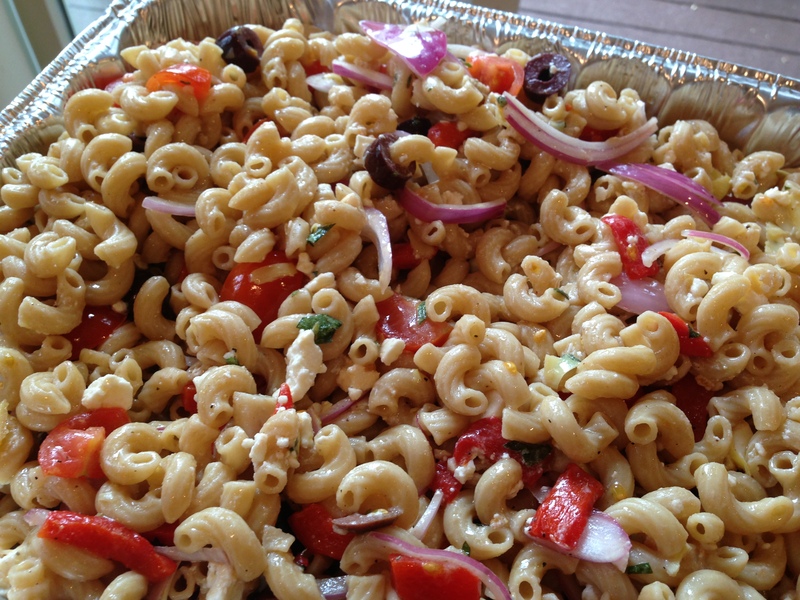 Meanwhile, slice the olives, red peppers and red onions and add to a large mixing bowl. Quarter the cherry tomatoes and chop the artichoke hearts; add to the bowl. In a separate small bowl, mix together the garlic, herbs, oil and vinegar. Salt and pepper to taste. Once the pasta is cooked, drain and add to the vegetables. Stir to combine. Add the dressing and stir until well coated. Refrigerate for 1-2 hours, then add the feta. Serve cold or at room temperature. The salad was inspired by a Google search of Israeli cous cous salads, which led me to the Food Network. It combined some of my favorite summer veggies and flavors, and I could not pass up the craving since summer weather was premature in Boston this past week! (80+ degrees on Thursday, in Boston, in March?!) I decided to adapt it to use roasted instead of grilled veggies, and added some wheat berries for extra texture. This was such a good idea – the chewiness added a lot of depth to the texture of this salad. The result is a filling and healthy salad that will never be mistaken for “rabbit food” again! The leftovers are even better as the flavors come together, and are great over mixed salad greens for a little extra veg! Well, it is about time that I face reality. Even though it is abnormally warm in Boston, my beach vacation is over and I am back to the books for the next two months. I will be putting in some long days of studying for the USMLE Board Exams, so my routine is starting to look pretty monotonous. Study, eat, study, run, shower, eat, study, study, study, eat, sleep. I didn’t know it was humanly possible to sit for so long and cram so much information into my brain each day! At least I have good, healthy food to power me through the day. A productive day always starts with a good bowl of oatmeal in my book. I made my trail mix oatmeal, adding cinnamon and chia seeds to the mix and cooked in just water, since I have run out of unsweetened almond milk! Delicious and wholesome, enjoyed with black, French press coffee and a bottle of water. The warmer weather makes salad eating much more enjoyable! A few friends and I met for lunch, and sat on the lawn in front of school to take full advantage of the beautiful weather! I had a big bowl of lettuce topped with thawed corn, peas, a black bean burger, and salsa. This was pretty spicy, and huge! Good thing I had a big bottle of water to wash it down with! I was pretty hungry after my morning of sprinting and biking, so I had a big bowl of Greek yogurt when I got home! I used some applesauce to sweeten it, and added a bit of almond butter, cocoa powder, and cinnamon in an attempt to get something comparable to a chocolate pudding. It wasn’t exactly what I was going for, but it tasted good enough. Plus, the protein powered me through the rest of my afternoon of studying! An impromptu roommate dinner was called for by Marie this morning! Who am I to say no to a chance to cook a delicious meal while processing life with such a good friend? We made what I am calling Cauliflower Dal, and it might be the best recipe we have concocted in quite some time. It is simple, flavorful, and really healthy! The recipe post will be up tomorrow, if you are interested! We chose naan over rice to help soak up the sauce, and enjoyed a leisurely dinner together. Even though my day was busy and life is starting to get stressful, my health is a priority and I am glad to take the time each day to prepare and fill myself with good, nutritious food! Remind me that when things get even crazier in the upcoming months! Question: What is the best thing you ate today? Salads seem to be the pinnacle of healthy eating for many people – they can be a great way to load up on veggies, cut back on calories, and feel light and clean. However, salads can also be pretty unsatisfying. My friend, who is trying to be healthier for her New Years Resolution, is famous for her complaint. “I had a salad for lunch, and I’ve been starving all day!” It is always disappointing when your $12 salad from the salad bar leaves you wanting more just an hour later! Salads that are too low in calories can be a bust for any dieter, since it will lead to unintentional and mindless snacking later. Salads can also be unassumingly high in calories as well! At many chain restaurants and fast food establishments, salads contain more than 600 calories, which is more than most dieters bargain for. If most of these calories are coming from salad dressing and low-protein, high fat toppings, hunger will strike more quickly as well. So how do you make a salad that will stick with you but not on you? In order to make salad eating more sustainable, I have figured out a few tricks to help me stay full and satisfied throughout the afternoon. First of all, portion control does not apply when it comes to salad bases. I have polished off a whole head of Romaine lettuce in one sitting before! Salad bases can include more than just lettuce, too. I include other veggies, like broccoli, peppers, carrots, or spinach as part of my salad base. They are voluminous but not calorie-dense, so volume is not as important. Next comes the good stuff, the stick to your ribs in a healthy sort of way. Avocado, nuts, seeds, and dried fruit help add flavor, interest, and dimension to a salad. This makes it less boring, more satisfying, and more filling. Protein is also important, whether it is through beans, nuts, seeds, tofu, etc. My favorite salad topping is chickpeas! Last step is the dressing: I am not a fan of pre-made salad dressings since they tend to have a lot of added salt and sugar, and can often be laden with hidden chemicals. My stand-by dressing is Balsamic vinaigrette, but recently have enjoyed some unexpected oil-free combinations. Hummus and Balsamic vinegar can make an interesting creamy salad dressing, and nutritional yeast, Dijon mustard, almond milk and water make for an interesting cheesy dressing. Salad dressing and toppings can be the place where calorie counts creep up on salads, so portion control is more important here. However, using real ingredients to make your salad satisfying will help keep your body running well! My recent and unexpected favorite salad add-on: roasted Kabocha squash. Kabocha squash, also called a Japanese pumpkin, is a sweet, orange squash that I have recently come to love. I cut it in half, scooped out the seeds, and then sliced it into squash fingers. After sprinkling these with chili powder, cumin and salt, I roasted them in a 350 degree oven for about a half hour. I sliced the squash from the rinds and then cubed it over a giant salad base of Romaine lettuce. I added some green peppers, carrots, chickpeas, and avocado. Topped off with the unexpected nutritional yeast-mustard dressing, I was in salad beast heaven. I actually made this dinner two nights in a row, it was that good! The squash that wasn’t added to my salad was enjoyed like sweet potato fries, dipped in a bit of BBQ sauce. I will definitely have to get another squash before the winter squash season is over! Question: Are you a salad fan? What is your favorite salad combo? Happy Wednesday everyone! 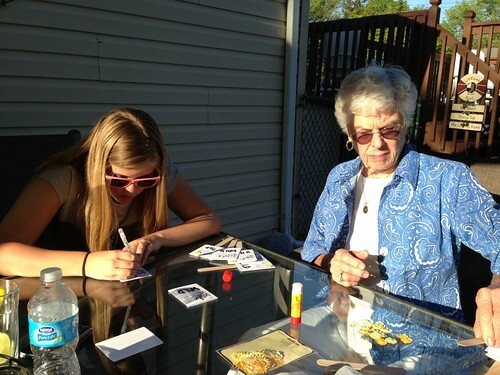 I have had the best few days at home and have thoroughly taken advantage of my vacation from school. For anyone still facing 2 more days at work, keep that sweet holiday vacation in the forefront of your mind… Christmas will be here soon! My days have been filled with baking Christmas cookies, making awesome meals with my mom and sister, crafting, gift wrapping, and relaxing on the sofa. I could get used to being this spoiled with so much free time pretty quickly! Here is a peek into my day that isn’t spent hunched over textbooks for hours on end. Be sure to check out Peas and Crayons and the WIAW link party for other weekday meal ideas. I enjoyed sleeping in and waking up to no alarm. I caught up on some blog reading from bed on my phone, snagged a handful of peanut butter pretzels, and then went out for a short run. I am finally over the worst of my head cold and was itching to get outside. I only made it a mile, but it felt good to just get out and get moving. After a short set of free weights and a shower, I made eggnog spiced oatmeal. I am not a huge fan of eggnog because it is too thick and sweet, but like the way this hints at the Christmas time classic. A little banana for natural sweetness, with vanilla and rum extracts, cinnamon and nutmeg for eggnog flavor. I loved it the way it was, but my sister added a bit of brown sugar to make it taste more like classic eggnog. A great and filling holiday breakfast either way! My mom is much better stocked with salad veggies and fun condiments than I am, so I enjoyed making a killer salad for lunch. Red leaf and romaine salad, carrots, radishes, snap peas, roasted broccoli, goat cheese, and black bean and corn salsa – salad heaven! With a slice of bakery bread on the side, I could barely finish! My eyes were bigger than my stomach, and I had to sacrifice a few of the snap peas. All made from recycled magazine pages! I spent the rest of the day at my friend’s house for a crafternoon. I am really excited about what I made, all out of recycled magazine pages! The top is a coaster, then a pair of earrings, and what will soon become a necklace. I was Pinspired again, and was happy to have a few hours to kill making a craft. It is much easier than it looks, so check out the tutorial and give it a try. My sister and I made our last batch of Christmas cookies, so of course some taste testing had to happen! We like to create characters out of our Gingerbread men, so I chose to eat the “Running Man Gingy” since I love to run! These were our best ever Gingerbread men, and our best looking ones too! If you are looking for Christmas cookie recipes, check out my posts from earlier this week, and stop back tomorrow and Friday for the last two! Question: Are you on vacation yet, or are you still counting down the days?